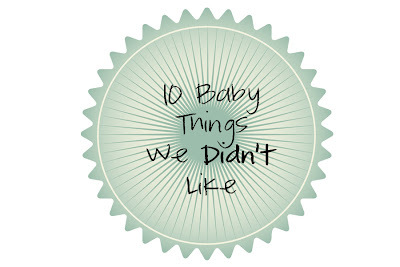 Every family has a list of baby items they love, but I was thinking about those items that wouldn't fall under the love or like category. They would fall under the "strongly don't like, hate, or never use," category. It didn't take me too long to think of the items that would make up my list! Living in the Middle East you would think that we would love sleeveless and pantless things alot more, but the truth is, it's just the opposite! We run our AC year round and have to have it on pretty strongly to combat the extreme heat. The inside of our house is cool to cold at most times, especially at night, and the direction of the air flow can be right on our little babies and their cribs, so covering their arms and legs are an necessity. Because of all of that, we use button up and zip up footie pajamas almost exclusively for the first 6 months. I love the look of them and that this is the only time in life they can get away with wearing pajamas 24/7! I occasionally like to dress my babies in "real" clothes or onesies, but maybe once a week for a couple of hours. Because of that, onesies (short sleeves, no pants,) and socks were just unnecessary! I can't tell you how many onesies we have that have only been put on for a picture, and the DOZENS of socks. In my opinion, you only really need 10 pairs of socks, period! There is so much information about keeping loose blankets out of your child's crib and how unnecessary it is to cover them up with a blanket that it is surprising just how many blankets you acquire. We were full time swaddlers too, so we really DID use blankets alot, but we have 5-6 that were just to fluffy for swaddling, or to large to hold the baby in comfortably. A good set of swaddle blankets and one special blanket to wrap and carry the baby in is all we really needed. Now, I know I might get alot of heat for this, but this is just my opinion. I have a whole set of cloth diapers, covers, liners, and all in ones. By several different companies. I've used them at times for both of my girls in several different ages and sizes. And I hate them. We hate them. They are big, fluffy, make you move your kids pants up a size, a lot more work to clean, and, in my experience, leak, lead to dampness and diaper rash. Now, you can read all sorts of things and you can see both camps say the same things about either types of diapers, but this was my experience. I also don't think I cared about how "cute" the covers are because my babies wear clothes and I never see their diapers! Maybe we just don't make snotty kids, but as infants, neither of our children needed the nasal aspirator more than 3-4 times. We were able to wipe much more effectively. Still a handy and cheap tool to have around, just in case I suppose. Someone warned us before we had Grace to not even consider a wipe warmer, since once their little heinies were used to warm wipes it was difficult to use room temperature/cold wipes if you were somewhere else. I'm not sure if that's true (though it makes sense,) but we saved a few bucks and just skipped that altogether. We've had 3 different play gyms and were unimpressed, as were our girls with them. Our first two were lent to us and then our third was given to us. I think it just might be the type they have over here though. Not very interactive and sturdy and the hanging things are placed at really weird angles/heights. This one falls under the "we don't use," category, not the we don't like," simply because we don't own them! With Grace, our apartment was so tiny we just didn't have the space for them. With Sophia, we had just moved into a new (huge) house but had to furnish it and didn't have the funds for those things. Both girls got lots of snuggle time or floor play and moved onto their boppy or bumbo when they were old enough. Less gear = less mess! I do think that Sophia would have really profited from a swing when she was struggling with her reflux though. Oh, I can't tell you how much I wanted a glider for both of my girls' nurseries. I dreamed of it and I hoped beyond hope that we would come up with the funds, but it was not to be. I hope that with future babies (several years down the road,) we can get one of these! We lived in an extremely dry climate (desert) when Grace was an infant and now live in a humid climate (10 minutes from ocean,) for Sophia's infancy and we've never used a humidifier. Now, my girls are extremely healthy (Grace had her first sick child visit to the doctor last week, at 2 years old,) so I suppose if your child is always congested then this would be a necessity! I've also heard how it can make a room much more moist (duh) and can cause mold to grow....just be aware! I am not entirely sure what you would use either of these products for and what their advantages would be over other products that we already use (diaper rash cream, baby lotion?) Either way, there were several bottles of stuff I passed on to new moms and said "I'm not sure if you'll use these, we never did, but in case you do, here you go!" Now, I'm sure most people read something on this list and thought "I use that all of the time," or "We LOVE that!" but this is my take on baby gear and items that aren't very necessary, useful, or worth my time and money! ha! We've used so many of those things. Lots of onsies, lots of blankets for her to lay on the floor during tummy time since she had reflux. Easier to clean a blanket than carpet! With the reflux and her terrible allergies we used the aspirator all the time...as well as a humidifier. Georgia LOVED her play gym and her jumper. Both were life savers! We still have and use her glider and I LOVE a baby with baby powder on! This is soooo funny to me! I agree w/ a lot of these! Our Dr. even said its not safe to use baby powder because it could go up their nose or in their mouth and they could choke on it/get in their lungs. Not sure why you would use it anyway. 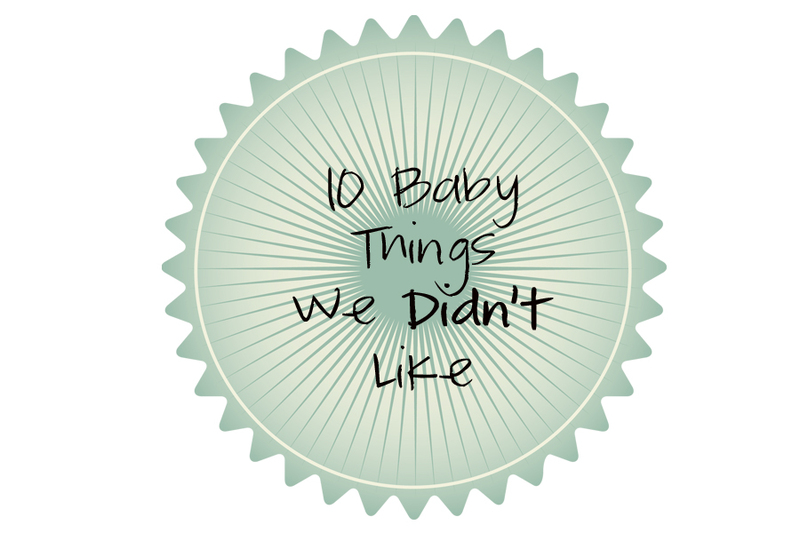 I wanted to love cloth diapers, but they didn't work out for us!